2 bedrooms, 3 bathrooms and 2 lounges, one of the two with a sleeper couch. On the ground floor there is a lovely living room, a TV room and a full equipped kitchen with all necessary appliances. The TV room have a sleeper couch that is eventually available for 1 adult or 1 child. A full bathroom completes the ground floor. On the first floor both bedrooms are fitted with King size beds and both have en-suite bathrooms, main with bath and separate shower, second full bathroom with shower. A small inner courtyard, connected with the kitchen, allows guests to dine al fresco. And why not have a drink on the beautiful furnished terrace on the roof, watched over by the magnificent Table Mountain. Complete the facilities of the house a washing machine, a wireless internet connection, electric heaters in all rooms and ceiling fans in both bedrooms. The main bedroom's en-suite bathroom have 2 basins, a bidet, a bath and a separate shower. The other two bathrooms are both en-suite full bathrooms. In both bedrooms and in the lounge cold and hot. On the ground floor there is a lovely living room that seats comfortably 6 people. A full equipped kitchen with all necessary appliances. There is a table that seats 6 people in the kitchen and another table in the inner courtyard to dine al fresco. The TV room have a sleeper couch that is eventually available for 2 children. A small inner courtyard, connected with the kitchen, allows guests to dine al fresco. And why not have a drink on the beautiful furnished terrace on the roof, watched over by the magnificent Table Mountain. The De Waterkant neighbourhood is home to a lively, tolerant and lifestyle-centric community. Yoga studios, B&Bs, bistros and hairdressers line the streets, and cultures from all over the globe mingle freely and happily. 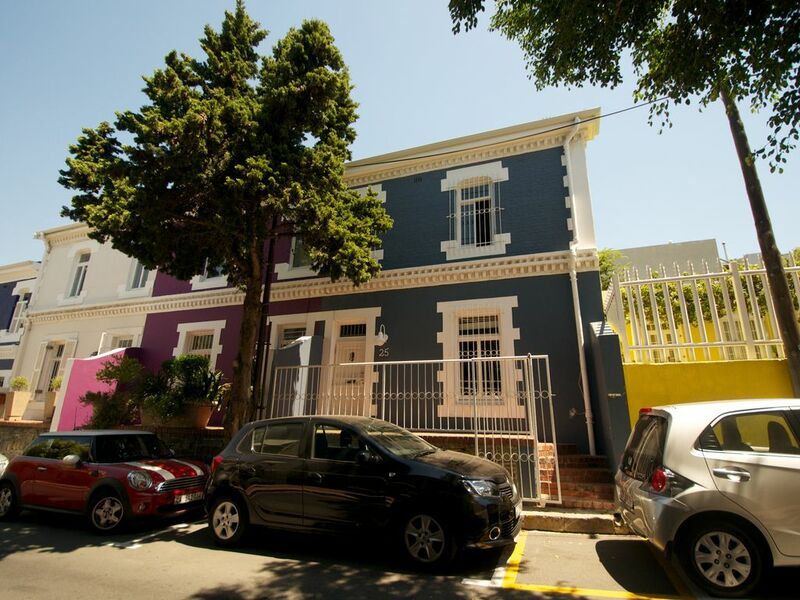 De Waterkant is now Cape Town's most fashionable district, with beautifully restored Victorian homes painted in bright hues crammed into a tight cobbled grid of streets, climbing up towards Signal Hill. This is the city's main gay area, with excellent nightlife and a wide choice of super-trendy restaurants, bars and boutiques. Most of these are in the Cape Quarter, a shopping/dining complex with a charming outside piazza with a central water feature and trees with twinkly lights. Today this sought after area is the antithesis of its troubled history. Still reflecting much of its 200-year-old architectural heritage it is a cobbled street shoppers delight, De Waterkant is filled with coffee shops and interior design firms. Affectionately known as the ‘pink area’, it is internationally renowned for its open-minded attitude and gay-friendly night spots.